Today’s adventure was going to the summit of Mauna Kea, the highest point in the state. 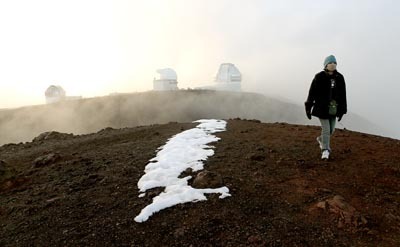 The forecast for Mauna Kea called for a 20% chance of fog and 0% chance of precipitation. 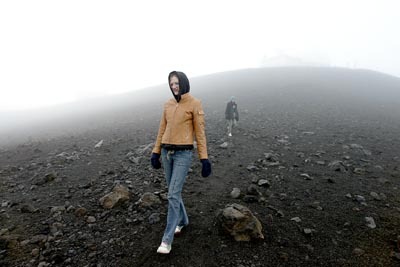 Here Andrea, front, and Karen start the hike to the summit through the fog, guess we hit that 1 in 5 chance. In the thin-air we had to push ourselves to make the short hike down from the platform area of the mountain, along a little saddle between that and the actual summit of Mauna Kea. 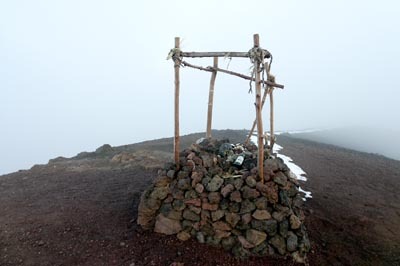 That’s the summit area where someone has built a lele (altar). Andrea and I tend to ignore pain or tiredness when hiking. Karen has apparently evolved to the point of not being accustom to this hiking business, being out of breath due to the major physical exertion in the oxygen poor enviroment. She didn’t want to continue on, so we left her on the trail up to goad her into following. It worked, Karen eventually made it to the summit too. It was freezing cold, a little breezy with some very light snow falling at one point. Here Karen makes it to the top of the state. 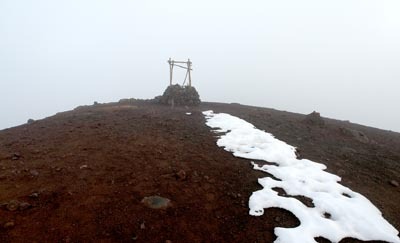 A closer view of the lele on the summit pu`u (cinder cone). People have left junk on there as offerings, we should have taken that stuff off as it doesn’t belong up there but we had no trash bags to carry that stuff off at the time. Really folks, only leave footprints and take photos when visiting places as they say in the National Parks. There was an old bottle of wine or something on the lele, not exactlly Hawaiian in nature. 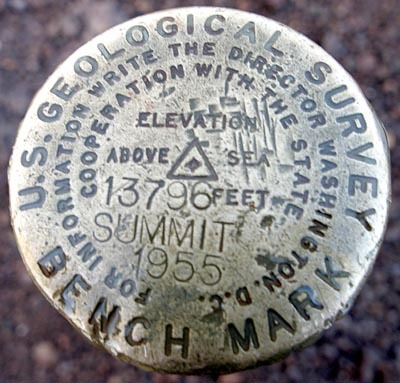 And the USGS benchmark on the summit of Mauna Kea. I had not been to the actual summit for a decade, though I’ve been up the mountain several times. Cold weather, ice, snow, winds, etc had detered me in the past from making the trek from the parking area to the cinder cone where the summit actually is. Glad I went up there, I’ll probably be up there again, hopefully on a nicer day. After that it was a night of star-gazing which wasn’t too good due to the fog but got a little better as the night wore on. We continued down to the Onizuka Visitor’s Center but it was so foggy that stargazing was impossible. Next mission for the night was finding food…which way to go…Waimea? Kawaihae? Waikoloa Village? Back to Kona? It was about 9pm and most places close about that time since this isn’t the big city with 24/7 dining. We headed to Waimea, found everything closed and given the choice of McD’s or Subways we ended up having some subs. Now for the misadventure and part of the reason all these blog posts are late. Just when I finally got back to Kona to Andrea’s house my car rattled, then died. The motor would turn a little but that’s it. At least we made it back there. I figured a timing belt must have broke, or something similar. So I got a ride home courtesy of Karen. An end to a not quite 100% successful adventure day.